Management Studies is offered as a Part II-only course. Students at any College can apply to transfer to Management Studies after two or three years of studying another subject at Cambridge. No undergraduate business degree by itself can teach someone how to be a competent manager: that comes with experience, and then further education. What Management Studies enables you to do is to study the subjects relevant to management and the environment in which the manager operates, whilst still a full-time student. You develop a sound understanding of the fundamentals of management and various aspects of management practice, as well as gain practical experience in a real-life context. You acquire the skills that a good manager needs, including the ability to apply critical analysis to management issues and an awareness of the responsibilities of managers in an economic, social and environmental context. 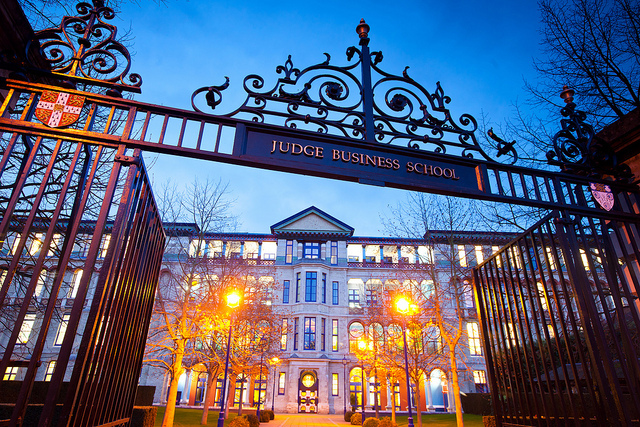 The Judge Business School – one of the best in the world – is responsible for Management Studies, and provides library and computing facilities for both carrying out coursework and preparing papers and presentations. However, amongst the most stimulating resources on the course are your fellow students: they come from different subject areas and have contrasting strengths, enabling you to learn from each other. The value of our course is evident in the successful careers of our graduates. Since its introduction in 1986, Management Studies students have found little problem in finding the type of employment they seek in industry and commerce. Recent graduates have gone on to careers in consultancy (for private equity and trade), marketing and communications, recruitment (in one case, starting their own consultancy), IT and information systems, and the finance sector (including an investment analyst and a risk analyst). Teaching involves lectures, supervisions and other active learning methods, such as a negotiations workshop. Competitive entry after two or three years of another Cambridge course. Please note that not all Colleges allow students whose original course is three years to stay on to take Management Studies as a fourth year.